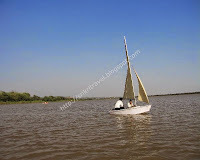 We booked package tour through Panicker’s Travel, Bangalore. We started our trip from Bangalore to New Delhi in Karnataka express and reached New Delhi after 40 hours of journey. From station we reached Panicker’s Travel guest house, Karol Bhag (near their office). The climate was very hot and humid. We took some rest and went for shopping and were back to room early. Next day our bus started at 6:30 am and reached Chandigarh at about 1 pm. Our first visit in Chandigarh was Pinjore Garden. Before getting down from the bus, travel guide distributed caps. We were given 90 minutes time to view the garden and return. This garden is also known as Yadavindra Gardens. 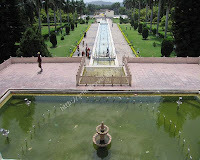 It is one of the beautiful Mughal gardens with lots of greeneries and fountain in centre of the garden. The place is very serene and it is said that Pandavas stayed in this place when they were in exile. We had our lunch and visited Sukhana Lake, which is man made and is surrounded by hill. We bought ticket for 2 seater pedal boat and were excited to go for a ride. This was our first pedal boating experience and were given 30 min. of time. The lake was big enough to spend our time and enjoy the ride. We completely relished the moment. It is also known as sculptor Garden. Nek Chand initiated this garden and has used most of the waste and thrown away items into the fantasy Rock Garden. 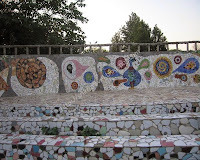 Haryana government helped Nek Chand to develop /expand the garden. He had used broken bangles, ceramic, glass pieces, old tyres, metal wires, electrical waste etc. There are beautiful water falls, pot arranged one by one vertically, china plates made into swan, peacock design using plates, Dancing doll etc. In the last phase of this garden, we saw wall decorated with marble and there were few swings to enjoy. Hope one sees this garden and gets inspiration from Nek Chand. Moral of this garden is not to waste any items. Anything and everything can be converted to useful items. We were shown rose garden from the bus :(. Our guide told us that there were no roses in this season (in May). Then we were taken to Hotels Park Inn for our night stay and we had our dinner with group.